Although we at wholesale2b, can create a nice website for you using our own cart software, some of you may prefer to use Shopify.com instead to create your website. The bad news is that Shopify is just a shopping cart service, so you still need to find ways to add products to your website. The good news is that you won’t have to look any further to find ways to load products to your site. Wholesale2b can help you load thousands of dropship products to your Shopify website very easily. With wholesale2b you can easily add products from any of our integrated dropship suppliers to your Shopify website. We have over 1 million products to choose from over 100 suppliers. Plus new product and new suppliers are added almost every month so your selection will keep growing, helping you grow your business with almost no effort. A) an account at shopify.com. They will host your website. B) an account with wholesale2b.com. We will provide you with the files needed to import products to your Shopify website. Wholesale2b offers various dropship plans and the one you will need to help you load products to your shopify website is called our “dropship datafeed plan”. With this plan you will gain access to custom files that are in the format compatible with Shopify. Simply choose your supplier(s) from our list and download your Shopify file to your computer. Then follow the easy import steps to add thousands of dropship products to your Shopify website. 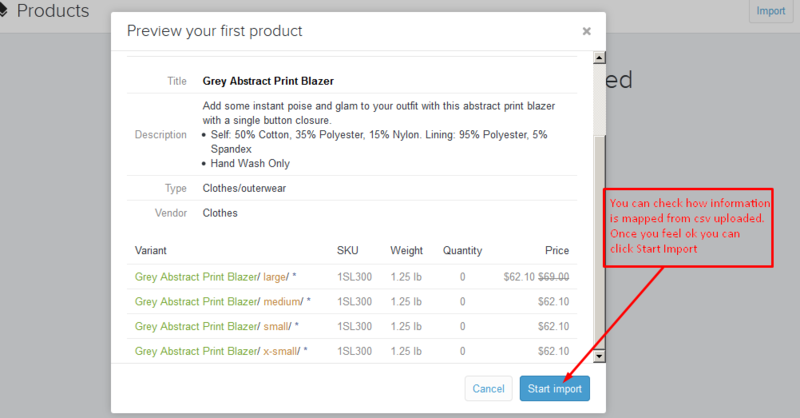 Here are easy step by step instructions to follow, once you have added a custom Shopify feed to your wholesale2b account. Shopify requires that the file you will use to import products be less than 20mb in size therefore wholesale2b will split you file into multiple smaller files and those will be zipped to a file named shopify.zip. Once your feed is ready, you will get a URL that you can copy/paste in a browser to download your Shopify feed to your local computer. Then you must UNZIP the file to get to the actual feed(s). 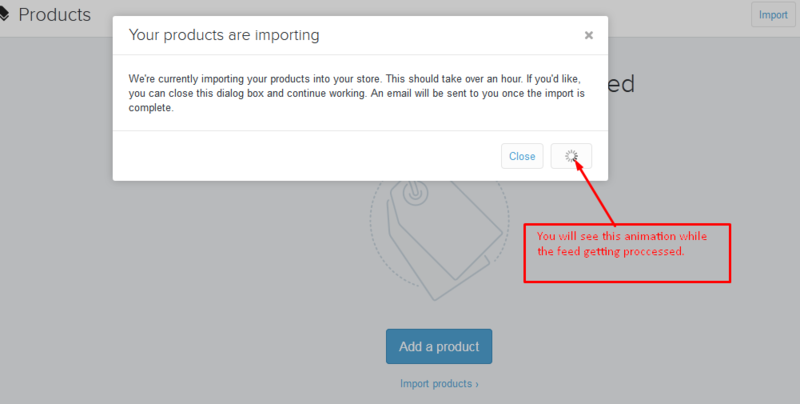 Then follow the steps below to import the feeds to your Shopify website. 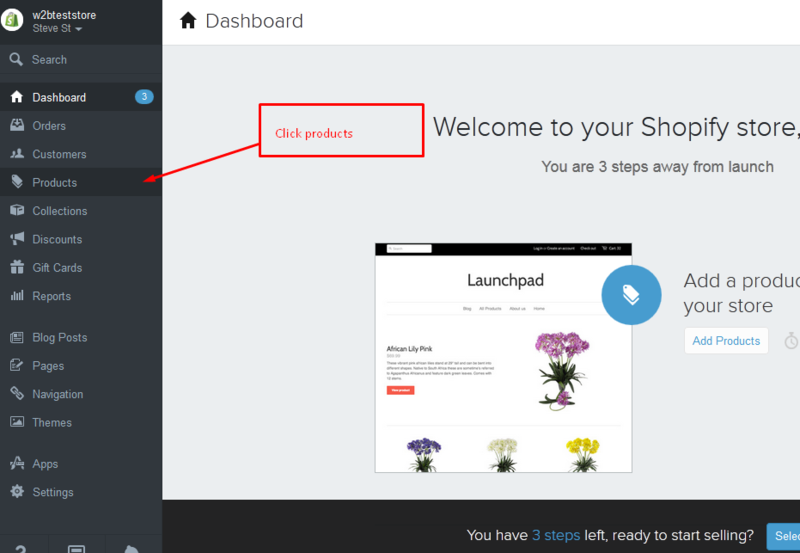 Step 1: First login to your shopify admin panel. Shopify will provide you with the login access to your website admin panel. If you don’t have it, then contact Shopify support. 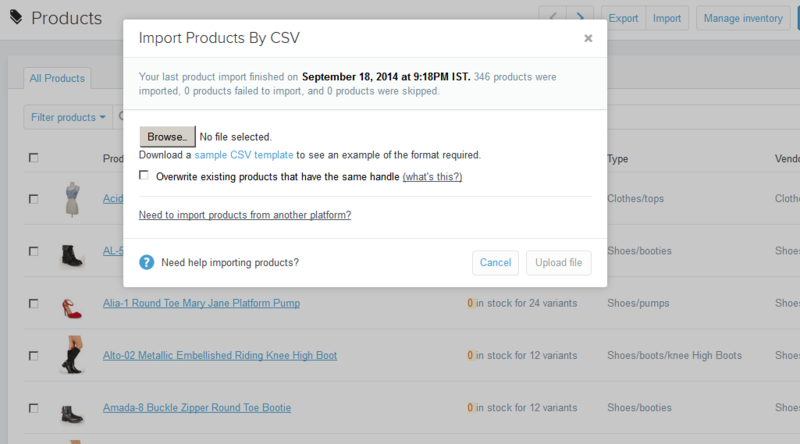 you can confirm and proceed importing file by “Start Import” button.